Enjoy a night out playing pool all evening with friends, *free practice, on-line stats & schedules, State championship pool tournaments that take you places, Nationals in a new and exciting city every year, local tournaments, **free drinks, cash, trophies and patches and more. $60,000 plus awarded! Read all about TAP and our many benefits. We invite everyone to play, from beginner to experienced. Our state-of-the-art computerized handicap system allows everyone to compete at their level! We can find a team for you to join or you can form your own team! Click here to register or just continue reading to learn more about our games and register below. We offer 8-ball, 9-ball and 10-ball! For more details on these games, visit our Rules web page. Teams are formed with 5 to 8 players. Five play each night. The format for all team games is match play, meaning each player competes against another player each week. Games needed to win are based on a player's computer calculated handicap. This format allows players to get into their game and provides scheduling flexibility for the players. We offer in-house and traveling options. We do our best to keep every division geographically compatible. Teams can pick their host locations or we can find one for you. Let us know where you want to play and we'll get the approval. Click here to see where we already play. Annual membership is only $20.00. Your annual membership entitles you to play in the TAP League as many nights as you wish, play in tournaments and receive the discounts listed in the right column. Weekly league play is $10.00. 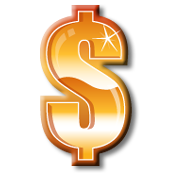 Click here to read all about how you can earn up to $115 in cash and free play for 8-ball and/or 9-ball. If you need immediate assistance, please call us at 702-558-7665. To review the Terms and Benefits of TAP Las Vegas, click here. I was a member of T.A.P. I was a member of another handicap type league. Terms: All applicants must agree to abide by the rules and regulations of TAP Las Vegas and The Association for Pool (T.A.P. ), Inc. All association members must exhibit courtesy and sportsmanlike conduct during all of their association and league activities. Benefits: TAP Las Vegas provides their members with score sheets, team statistics, individual statistics and rosters of the teams in their division. TAP Las Vegas will also provide the opportunity for trophies, cash prizes and to play in the annual national and local tournaments. As a member you are entitled to special privileges at many of the host locations and discounted pricing with Chappell Billiards. Start a new 8-ball or 9-ball 5-player team with 3 or more players new to TAP – Captain (or recruiter) plays FREE during weeks 9-15, *receives $25 at the conclusion of the session and their next membership FREE! Up to $115 in savings & CASH. Alternative incentive: Start a 9-ball team with 3 or more existing TAP League players who are new to 9-ball. Captain plays FREE in weeks 9 through 15 and their next membership after the current session is FREE! *Terms and Conditions below apply to these incentives. Earn $120 by forming a 8-ball or 9-ball team (with new, returning or existing members) to fill any bye slot and receive a crisp $100 bill! Incentive is paid after 4 weeks of play are completed. We'll also pay your membership when it comes due! Nobody likes a bye....we wanna play pool!! Bye slots exist on Monday, Tuesday, Thursday and Friday! This incentive is valid May 9, 2014 through week 4. Make-up matches will be scheduled for proper point distribution. If a team is dropped from another TAP division to form the new team, the offer becomes invalid. Only one incentive per team. Offers cannot be combined. Recruiter must submit a valid roster with a minimum of 5 players with current memberships no later than Friday, May 30. Forms and payment for new or renewed memberships can completed on-line or at a participating locations. Call the league office at 702-558-7665 to make these arrangements. All league fees must be paid to receive this incentive. Recruit a new TAP player for a team other than your own and receive a gift certificate for one free week of play! Certificate issued after player has completed registration and first week of play. See Terms and Conditions for more details. Incentives are our way of saying thanks and compensating our players for their assistance in helping the league grow. These Terms and Conditions are in place to insure the work that is being done is growing the league in a way that provides the income to be earned by the players. NOTE: The "New Team" definition below does NOT apply to the special incentive for summer 2014. Incentive available upon request, no coupon required. Incentive must be requested at the time to collect. No reimbursement. A "New Team” for 8-ball, 9-ball or 10-ball consists of 3 or more NEW TAP members. A player who's membership expired one year prior to the start of the session will be considered new. New members must play 6 matches throughout the session to receive the $25.00 at the end of the session and the free membership. Only one incentive can be earned per new team or player. For the recruiter to receive the incentive rather than the captain, they must contact us in advance of the team or players and provide the team's contact information. Free play for the team incentive is redeemable for the applicable night only in the session earned. The same night in which the new team is playing. Free play for the player incentive is redeemable any night of play. *Free practice is offered at most host locations. We have a list of those who offer this benefit. **Your team drink is a free drink offered mid-way through the evening. This drink must be whatever you have been drinking. 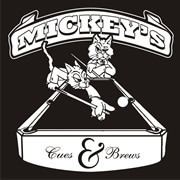 Mickey's Cues & Brews no longer offers the team drink.